Water pollution involves any contaminated water, whether from chemical, particulate, or bacterial matter that degrades the water’s quality and purity. Water pollution can occur in oceans, rivers, groundwater, lakes, and underground reservoirs, and as different water sources flow together the pollution can spread. The explosion and subsequent fire on April 20, 2010 in the Macondo Prospect oil field about 40 miles (60 km) southeast of the Louisiana coast killed 11 workers and injured 16 others. 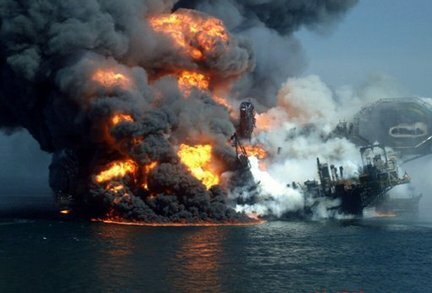 The explosion caused the Deepwater Horizon to burn and sink, resulting in a massive offshore oil spill in the Gulf of Mexico, considered the largest accidental marine oil spill in the world, and the largest environmental disaster in U.S. history. On the morning of April 22, 2010 (two days after the blowout accident), oil was leaking from the rig at the rate of about 8,000 barrels (1,300,000 litres) of crude per day. Over the 87 days before the leak was sealed it is estimated that between 2.5 and 4.2 million barrels were spilled. At a minimum that is over 400,000,000 litres of crude oil. The environmental and personal effect of this spillage was astronomical to wildlife and people in the Gulf of Mexico.